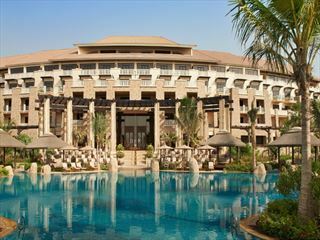 The Residence is the intimate and romantic section of the lavish One&Only Royal Mirage resort complex in Dubai. 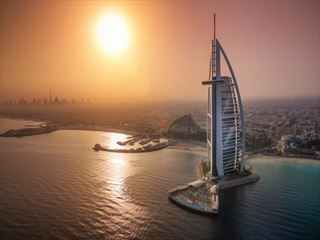 This makes it perfect for couples looking for a getaway in the sun – make the most of the private stretch of Jumeirah Beach and the variety of restaurants on-site. Guests staying at the Residence have exclusive use of The Dining Room, a luxurious restaurant serving up some of the best food in the country. 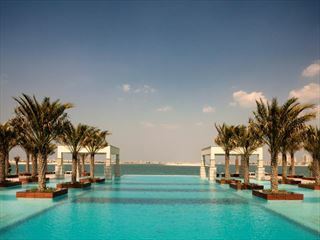 Further reading: One&Only Royal Mirage Residence & Spa is featured in our guide to the top 10 luxury hotels in Dubai. 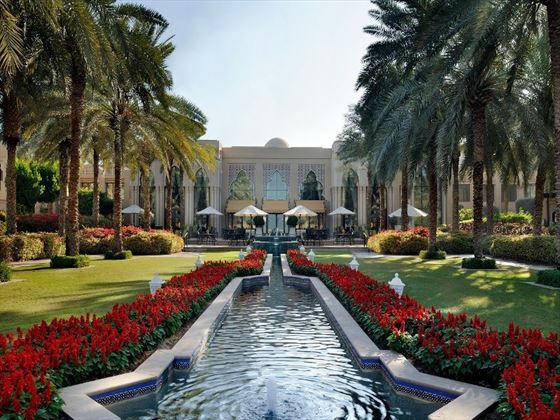 One&Only Royal Mirage Residence & Spa is part of the lavish One&Only Royal Mirage resort, also consisting of the family-friendly One&Only Royal Mirage The Palace, and One&Only Royal Mirage Arabian Court. 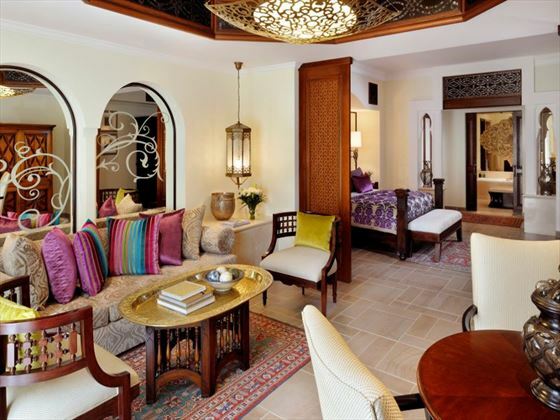 With wonderful views of scented gardens, the ornate gazebos adorning the private pool deck and the waters of the Arabian Gulf beyond, these rooms reflect the spirit of the Orient with intricately designed fabrics, carved arches, colourful mosaics and dramatic artwork. These suites feature an impressive wooden King-size bed on a raised platform that leads down to the living area with ‘Majlis’ style seating. The suite also offers a separate dining table, which alternates as a desk. An elegant and airy bathroom provides refreshing light with a slate floor and wet area with overhead and handheld showers, a marble bench, separate toilet and bidet, individual vanity and large bathtub with handheld shower. 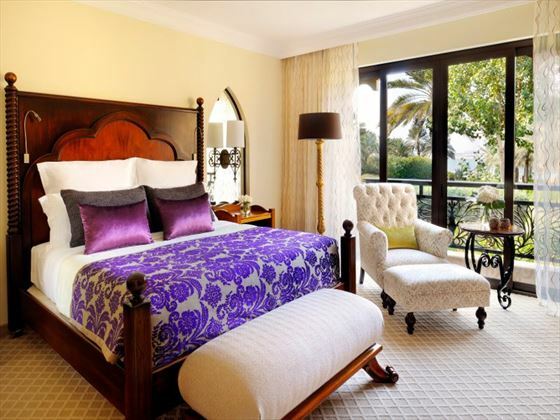 All Junior Suites may be connected with a Prestige Room, offering the choice of a two-bedroom suite with one main entrance foyer. Nestled in a discreet location a mere 40 steps away from the pristine beach and clear blue waters of the Arabian Gulf, the two-bedroom Garden Villa reflects the acclaimed Arabian architecture and features a private driveway entrance, dedicated parking and its own temperature-controlled swimming pool. 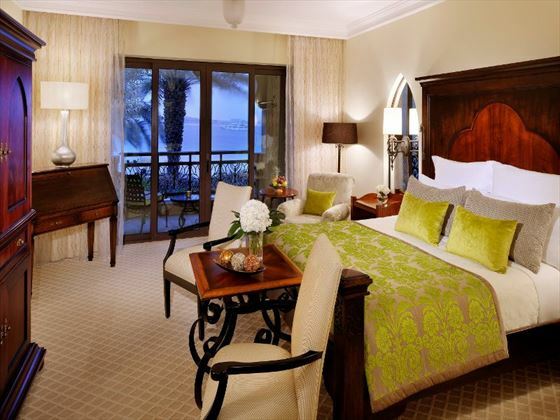 The spacious and exquisitely appointed bedrooms – 70 m2 and 100 m2 – face the sea and feature King-size beds. 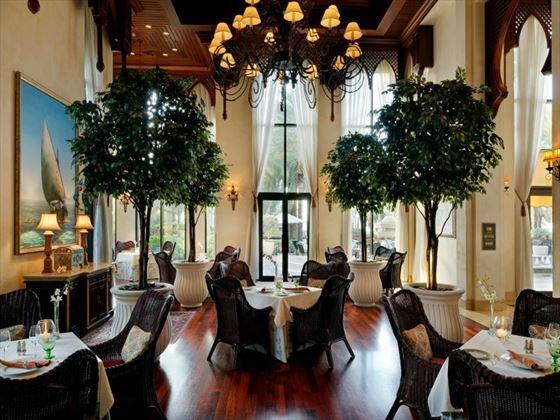 The rooms are separated by an Arabesque-styled lounge and dining area perfect for entertaining. The Garden Villa also features a kitchenette, ideal for hosting private dinners or gatherings. The magic of the desert, the playfulness of the sea, and the wondrous castle-like architecture of the resort make One&Only Royal Mirage a pleasant destination for families traveling with children of all ages. A superb KidsOnly program is specially designed for younger members of the family with fully-supervised, age-appropriate activities for children ages four to eleven years old. Two dedicated children’s centers– one in The Palace, the other at Arabian Court – are open every day of the week. Here, children can engage in programs of fun and adventure, leaving parents to enjoy quieter moments of solitude. KidsOnly is a complimentary club for children ages four to 11. A full program of entertainment and activities is offered daily from 10am to12.30pm, from 2.30pm to 5pm and again from 6pm to 10pm, with children typically joining their parents for meals. Tailored to various ages, activities might include: camel riding, henna painting, belly dancing, sand sculpturing, evening Arabian camping and more. Little ones learn basic Arabic phrases during fun, interactive lessons. Children under four are welcome to participate in activities for the younger set, but must be accompanied by a parent or guardian. Such services can be arranged through the resort for a fee. Please book early during festive and special vacation seasons. With the softest white sand lapped by the warm bright waters of Palm Island Bay, a kilometer-long private beach is the perfect playground. One&Only Royal Mirage offers a wide selection of water sports including sailing, kayaking, Hobie Cats, windsurfing, water-skiing and fishing. 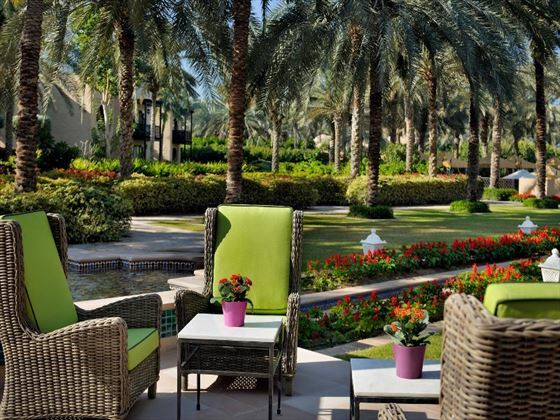 One&Only Royal Mirage has its own extensive private beach on the Arabian Gulf. 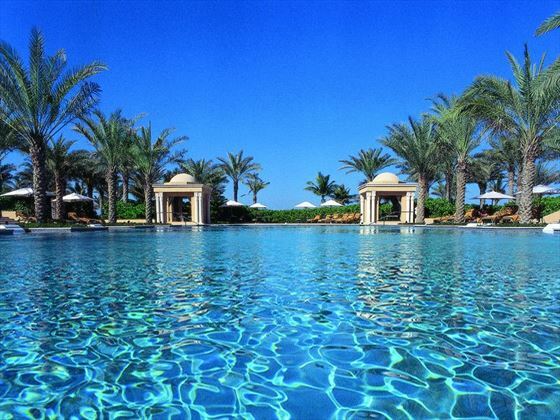 There are impressively designed temperature-controlled swimming pools throughout the resort. The Residence has its own private pool in addition to those available for Residence guests in the rest of the resort. Embark on a journey of culinary discovery through the eclectic and vibrant Near East and beyond. Colorful Indo-European dining, modern food with an Asian twist, rooftop Oriental mezzehs…One&Only Royal Mirage offers a splendid array of experiences, from grand and intimate to lively and casual.